Fit for a king or queen, Thorngrove Manor Hotel in Crafers is an architectural masterpiece and one of the world’s most luxurious boutique hotels. Behind all of the intricate designs is owner, builder and architect Kenneth Lehmann who began visioning the design for a niche hotel in 1977 after identifying a gap in the tourism market. It was not until 1984 that this concept began to unravel when Kenneth and Nydia purchased the Thorngrove Manor property which was originally part of Derrymor Estate. “I wanted Thorngrove to be a vision of architectural art and a hotel that was beyond works of art hanging – I wanted the walls themselves to be art,” Kenneth says. 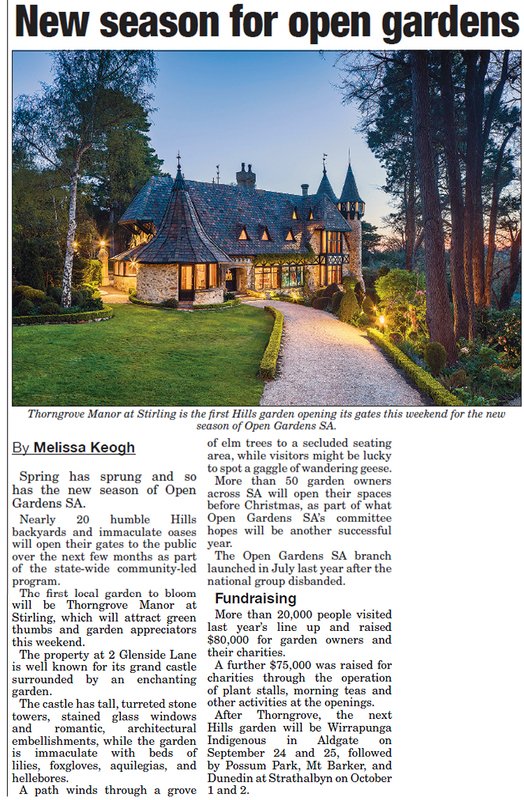 “I fell in love with the Adelaide Hills after undertaking numerous building projects in the area,” Kenneth says. Thorngrove Manor is a large and highly complex castle with distinctive baroque towers and romantic and bespoke interiors. Everywhere you look you will see signature artworks, hand-painted friezes and antiques. It offers individual living spaces for guests to hideway from the world and revitalise in pure luxury. When asked about the architectural design, Kenneth described it as an “extremely personal expression”. “Thorngrove was created to perform a function and service, but also to be an ornamental and artistic landmark building. “Interiors are crafted to indulge the senses and are a harmonious marriage of technology, texture, colour, and the modern domestic gothic ideals of shade, light and scale. But the journey has not always been easy, as Kenneth struggles with severe dyslexia and partial deafness. “Having what I call “invisible” disabilities has placed constraints on my ability to achieve my potential academically, professionally and has impacted my ability to relate in social situations,” Kenneth explains. In their quest for uniqueness and originality, Kenneth and Nydia are always renovating or improving the property in some way. “Unlike the usual hotel cycle, where things are run down, we constantly upgrade and renovate,” Kenneth says. Thorngrove Manor Hotel has been listed on the World’s Most Luxurious Hotels for the past 21 years. Nydia continues to be amazed at how Kenneth has brought his architectural vision to life. “Kenneth has created a remarkable hotel and is a rare example of how a dream can be achieved,” Nydia says. “He has set a benchmark and marked the Adelaide Hills internationally,” she adds. Thorngrove Manor Hotel has been listed on the World’s Most Luxurious Hotels every year for the past 21 years. Other recent awards include winning the 2016 Hotel & Spa Awards – Most Enchanting Hotel and Most Characteristic Hotel. 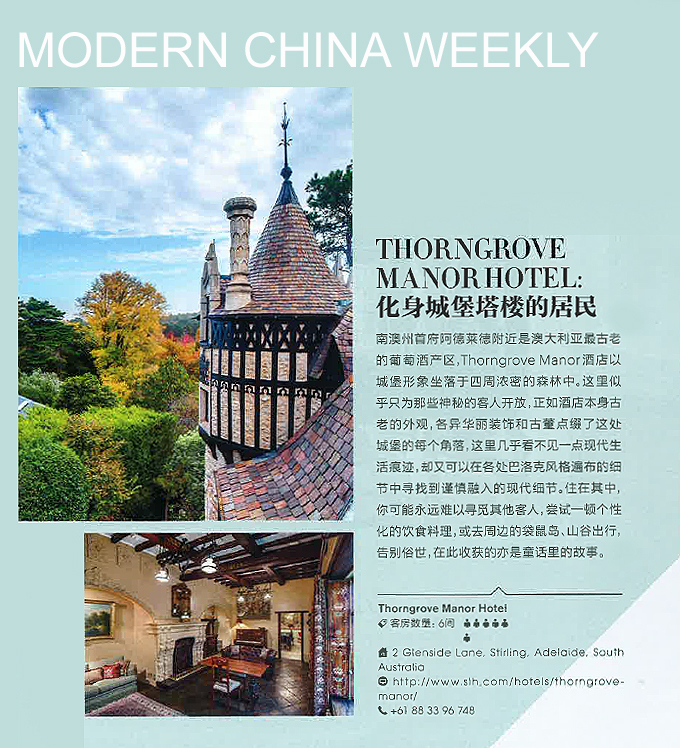 Thorngrove Manor Hotel was also a finalist in the 2015 HM Australia Awards Hotel Interior Design. Nydia says staying true to their niche and personalised service and not expanding has always been top priority. “The whimsical creative architecture appeals to people with an affinity to design and for those with ‘romance in their soul’,” she laughs. “Our Small Luxury Hotel membership enables us to learn from the best in the world and we look outward not inward,” she adds. 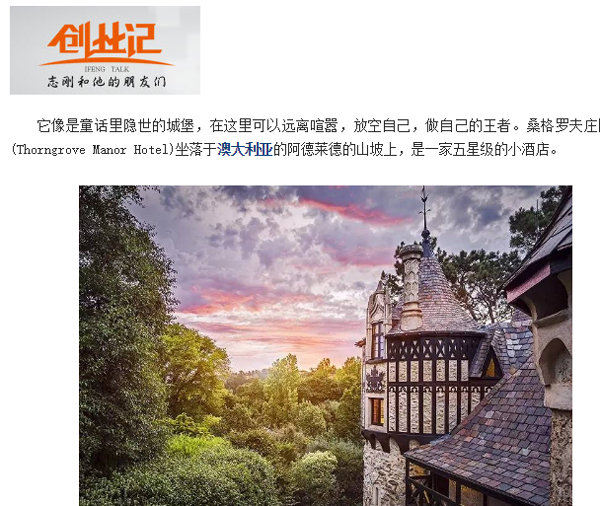 Thorngrove Manor awarded “Most Enchanting Hotel – Adelaide” and “Most Characteristic Hotel 2016” by LUX. Thorngrove Manor has been voted NUMBER 1 in Top 10 Unique Getaways in Australia for 2016! Read about Thorngrove Manor in Travel 2 Next. 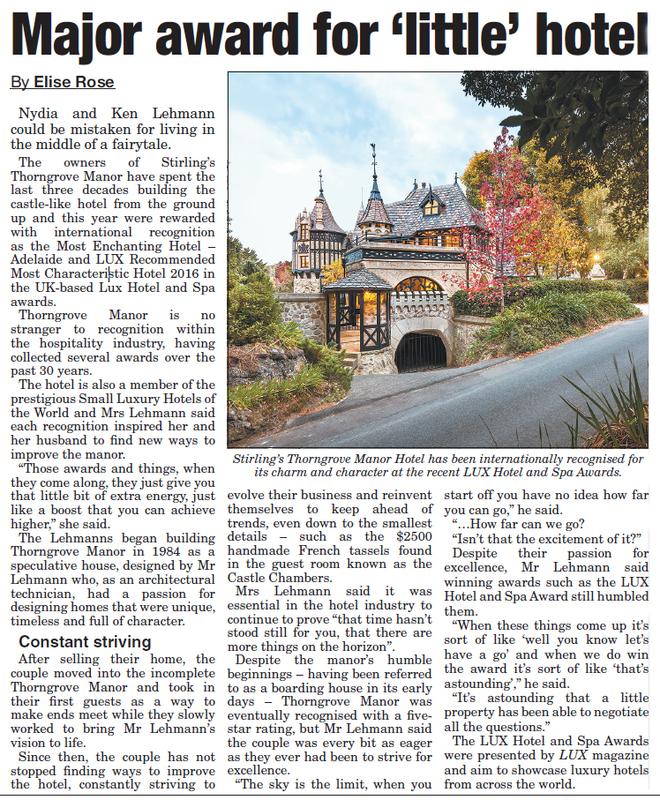 Thorngrove Manor was recently judge as one of the most beautiful and unique hotel facades in the world.